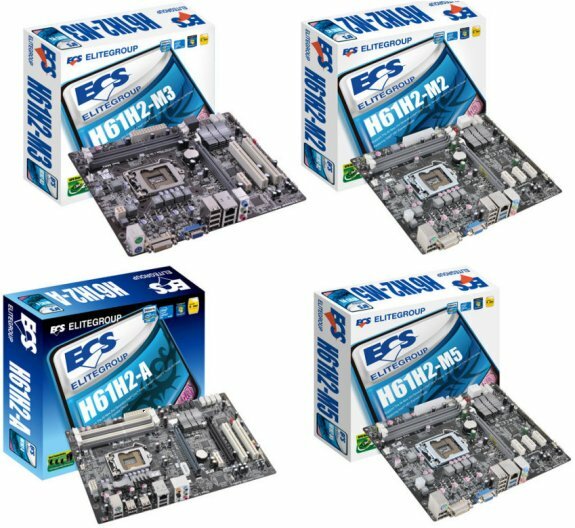 Elitegroup Computer Systems (ECS) as the pioneer in the motherboard industry with the best quality and the leading position introduces the latest IntelR H61 series express chipset motherboards. With ECS H61 series motherboards, ECS presents the complete motherboard options powered by P67, H67 and H61 express chipsets supporting the 2nd generation IntelR CoreTM processor family. The complete series family provides plentiful choices for users from heavy-gaming need to entry-level requirement. At the same time, IntelR also releases the new Sandy Bridge Dual-core processors for users to have more solution plans with less price. With the newest B3 stepping chipset, users can fully enjoy the SATA 3 Gb/s performance without worrying about degrade performance due to previous B2 stepping chipset. ECS introduces a series of H61 motherboards – H61H2-M, H61H2-M2, H61H2-M3, H61H2-M5, H61H2-I2 and H61H2-A with the highest C/P ratios. H61 series integrated with IntelR HD Graphics support users to enjoy entertainment moment without a discrete graphic card; meanwhile, it helps to lower power consumption and heat production with adopting the latest dual-core processors. ECS H61 series all equip with smart and useful applications- eJiffy / eBLU / eDLU / eSF to provide users more convenient computer-using experience. While IntelR positions H61 express chipset as entry level for 6 series express chipsets, ECS delightedly provides wide of options for users to meet different needs with form factors as ATX, Micro-ATX and ITX. For different demands, ECS H61H2-M series and H61H2-I2 motherboards integrating IntelR HD graphics support HDMI output providing users the high definition entertainment time. ECS H61H2-M and H61H2-M5 even support dual ports of USB 3.0 for users to experience the overwhelming transportation speed. Meanwhile, ECS H61H2-M3 and H61H2-A equip with EZ charger especially for APPLE users to enjoy the convenience of charging speed. Finally, ECS H61H2-A supports non-disc system and provides basic functions for users who only require for simply use. After ECS H61 series motherboards join the family of IntelR 6 series, ECS presents to satisfy every kind of desires of motherboards. All ECS H61 series motherboards are all compatible with the latest 2nd generation IntelR CoreTM processors in LGA 1155.